Do I Need A New Switchboard? Home / Blog / Do I Need A New Switchboard? Do you have the type of electrical switchboard that has fuses? Have you ever been told that you need to upgrade it? 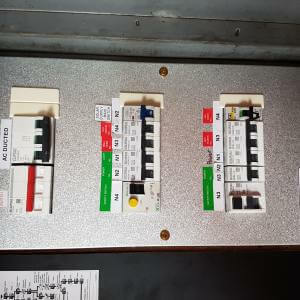 This is a common recommendation from electricians, and there are many reasons why a fuse-board should be upgraded to a new switchboard. Here are a couple of tips to determine when and it is really required or not. You want to install safety switches to protect your family or to comply with regulations for the sale or rental of your property. We recently went to a job to find out why a fuse had blown. The client had changed the fuse numerous times because it kept blowing but eventually he decided to put in a bigger fuse wire and voila, the power stayed on! Happy that he had fixed the problem, he decided to turn on the three new electric heaters he had just bought on special at the local electrical goods store. Now he was very warm and happy. This temporary ‘fix’ only worked for a day or two and then the cabling started to heat up and melt behind the fuse panel. On the third day, the heaters stopped working. The client was not happy but thought “I knew these heaters were on special for a reason”. After further checking, he found there was no power at the power-point. So once again, he went out to the fuse board with his oversized wire to replace the fuse. On arrival he was shocked to find smoke coming out of his fused switchboard and small licks of flame. Luckily for him, the asbestos in his old fuse board prevented the fire from going any further. He put in the new fuse but alas, no power…. and after risking life and limb, finally he called an electrician! The fused switchboard and the cabling hidden behind that nearly put his castle on fire and beyond repair. We gave him a quote to replace the fused switchboard with a new circuit breaker switchboard. He, as would be expected, compared this quote with a few others. After some careful deliberation, he decided to go with Austec Electrical to undertake the works. Why? We are licensed electricians, cost effective and take pride in our work. You can be rest assured when the works are completed by Austec Electrical, they’ll only be completed to the highest of standards. Important Note: Although we live so closely to it, we should always remember that electricity is dangerous and can kill even when precautions are taken. Always use a licensed electrician, to help minimise the risks.